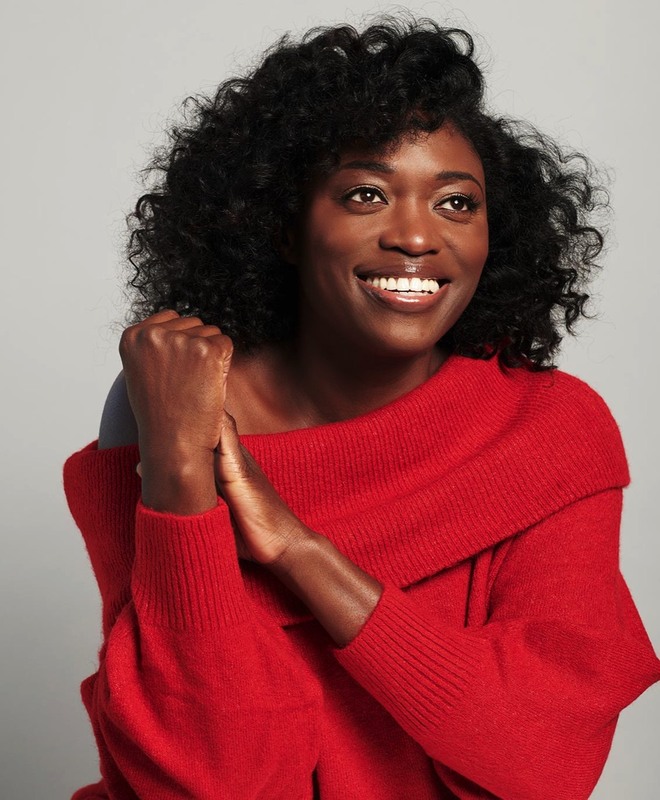 British-born actress Andi Osho has had an impressive 15 year career to date; she is best known for being a successful stand-up comic, but has since gone on to have an exciting career as an actress in film, television and theatre, notably Channel 4’s highest rated drama to date, Kiri, alongside Sarah Lancashire, and horror movie Lights Out directed by David F. Sandberg. 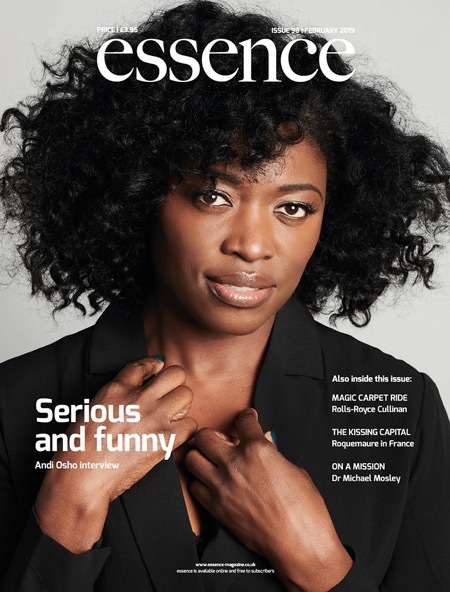 Here Andi talks to essence about her plans for this year. Q Andi, you began your career in TV production and then started acting. What attracted you to acting? A It was something I’d always wanted to do, but was too scared. However, in my mid-20s, I had a quarter-life crisis and decided to give it a go. Working in TV for ten years gave me some experience and contacts that made it a little easier, but it was still terrifying. What spurred me on was the thought that I didn’t want to die having never tried. Q Shortly afterwards you changed and became a stand-up comedian. How did you break into stand-up? A I didn’t switch lanes. I just added stand-up to what I was already doing. Getting my acting career off the ground was slow in the early days, so I got into stand-up so I could perform more regularly. It was as simple as that. I had no aspirations to be on TV or tour or anything like that. I just wanted to perform. Q Early in your career you won the Funny Women Award (out of 180 competitors). Were you surprised by that? A Winning the Funny Women Award was a total shock. In fact, when they called out my name, I checked with the other comics that it was definitely me who had won. I just couldn’t believe it, I’d only been doing stand-up for five months. As far as I was concerned, I was just this interloper who was winging it. It was a great night and opened a lot of doors. Q You’re an extremely versatile talent, can you describe a typical day if there is such a thing for you? A I go through phases where my day looks a particular way. At the moment I’m writing a book, so a typical day involves dragging my reluctant body to the gym before sitting down to a day of editing. I’ve completed the book so now I’m working on turning that first draft into something vaguely readable and funny. It’s a comedy so as well as coming up with a compelling story, I want people to laugh all the way through it. That takes a while to get right. Q Confidence plays a huge role in life especially in a public, media-facing job such as yours – would you agree? A Yes, but I think it’s also important to balance that confidence with authenticity so that you don’t feel you have to pretend to be something or someone you’re not. As I’ve gotten older, I’ve gained confidence from just learning more about who I am, avoiding toxic situations and people and being more present. Q Is it easy to switch between comedy and ‘serious’ acting? A I don’t think of it as comedy acting or serious acting. It’s just acting. I prepare for any role I take on and hope it’s what the director wants and that the style of acting I’ve gone for matches what everyone else is doing! Also, weirdly, despite my stand-up background, I haven’t been in many comedies. I tend to get cast in serious stuff like Kiri. Q You’ve been very successful at Celebrity Mastermind – what’s your secret? A Pick a topic that doesn’t require too much research! I chose The Matrix as my specialist topic the first time. I loved the films anyway which made it infinitely easier. The second time I chose John Humphreys as my specialist subject. That was harder to research and I felt like a bit of a stalker! It was worth it though because on the night it was funny hearing him ask questions in the first person. I’m glad he was so game. Q You’re a playwright. Can you tell us a little about this? A I’ve dabbled with playwriting, but my real passion is screen writing. I’ve had a few small commissions with E4 and SkyArts, but my goal is to follow Phoebe Waller-Bridge’s lead and get my own show made. That’s the dream. Q Have you noticed a change in attitude towards women and minorities from when you began your career? A Definitely. There’s a lot more inclusion on screen, but there’s also more acceptance of the conversation. Previously, people would host panels and wax lyrical that things needed to change, then everything would stay the same. Now there’s much more action to go with that talk. It’s exciting because all we’re really after is for the media to reflect how the world is, diverse. The next battle front is diversity behind the camera which is still painfully mono-cultured. Q What’s the question you never get asked, but would like to be? A Would you like us to commission your TV series? Glass half full or half empty? I got a smaller glass and then it was full. Q This year looks exciting for you. Firstly, you’re starring with Sean Bean and Adrian Lester in Sky One’s drama, Curfew. Can you tell us about this? A It’s a mad show that I’m not even sure how to describe. It’s basically about the contestants of an illegal street race from London to Scotland where the winner gets helicoptered to an island far away from the totalitarian government that has taken over the UK. See. It’s mad. Q What made you choose to play a part in Curfew? A Curfew is exactly the kind of show I would watch, so to get cast as Jenny is a total dream. I love high concept shows such as The Handmaid’s Tale and The Walking Dead. Tonally, Curfew is a long way from them, but there are similar elements. Unfortunately, I can’t say more without giving too much away! 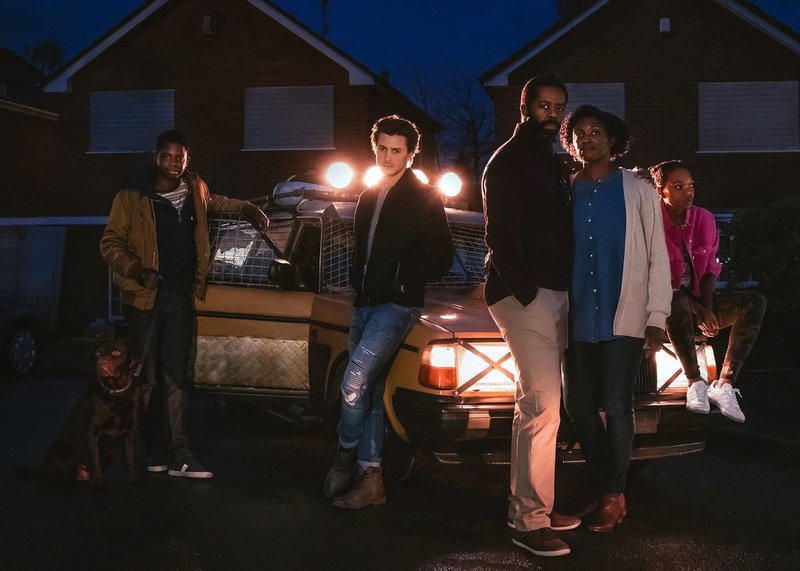 Q Anne Mensah, Sky’s head of drama, has described Curfew as the perfect Sky One show: funny, emotionally truthful and, above all, fast. Would those be your thoughts? A I think that’s the perfect description. It’s a real mash-up of high drama, humour, tender moments, blood, guts and lots of tears. There’s something in it for everyone. Q Could it be described as Mad Max set in the UK? A I wouldn’t argue with that, although it’s about more than just the race. On a subtle level, it’s about government overreach and what that can make people do. It also touches on corporate greed. I told you, something for everyone. Q Has Curfew offered new challenges for your acting career? A Definitely. This is the first time I’ve had a leading role and that comes with a lot of challenges and responsibilities. Luckily, I was surrounded by so much talent I was able to absorb and learn a lot from them. It’s not every day you get to work with the likes of Miranda Richardson, Adrian Lester and Sean Bean, so I took full advantage. Q Were you any sort of petrolhead prior to Curfew and, if not, has this sparked an interest? A Absolutely not. If someone asks what type of car I have, I say black. I wouldn’t say Curfew has turned me into a petrolhead, however, the first day we saw all the vehicles together when we filmed the start of the race it was pretty exciting. Not every character gets to drive a cool car though. My family, the Donahues, end up in something very, very sensible. Q In spring you team up with Mark Strong in DC Comics’ Shazam! – it looks like fun. You play Ms Glover. Can you tell us about the part? A Yeah, I was delighted to be offered this role by the director, David F. Sandberg. We’d worked together before on Lights Out, so he knew I was a safe pair of hands. The cool thing about it is he recently revealed on Twitter that my character is his way of tying his debut, Lights Out, to the DC Universe. The guy’s got game. Q Are you a DC comic book fan? A I wouldn’t say I’m a comic book fan, but I do really like their superheroes. Who doesn’t love Superman and every iteration of Batman has been fantastic and wildly different. Wonder Woman was a sensation. I couldn’t believe I was crying at the end of that film. And now we have Shazam! which looks like it’s gonna be a blast. Q What would be the ideal drama/film and part for you? A Any job where you really get to explore a character and get lost in it is something I would relish. Or anything that requires learning a new skill would be awesome. I’m always jealous of actors who come away from a job knowing jujitsu or how to play the piano. Q What are your future ambitions? A As I said, I would love to get my own show off the ground. I’d also love to land a film role that I can really get my teeth into. I watched Rami Malek in Bohemian Rhapsody. He was amazing and the role was an actor’s dream. Opportunities like this are rare. And, of course, I would dearly love to see my novel on the bookshelves! Other than that, I try to let things unfold as they will. I’ve been very fortunate over the last 15 years getting to work on amazing projects with fantastic people, so I’d love to carry on like that! Curfew starts Friday 22 February, 9pm Sky One. Andi Osho will also be seen in DC Comics’ Shazam! due to hit cinemas this spring.